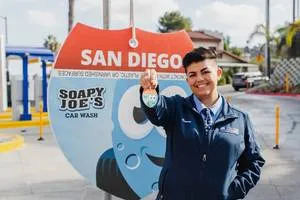 Soapy Joe’s Car Wash, a San Diego-based eco-friendly car wash company, was recently awarded the title of “Largest Car Air Freshener” by Guinness World Records. The record-breaking car freshener measures 3 feet 10 inches by 3 feet 8 inches by 1.6 inches. It was crafted using wood, pulp, and starch — the same proprietary biodegradable materials used in the company’s smaller, signature air fresheners. Soapy Joe’s developed the world’s largest air freshener last year as a way to celebrate its 20-year commitment to environmental sustainability initiatives, including water efficiency and conservation. As a pioneer in eco-friendly car wash technology, the family-owned company uses a water reclamation system that not only saves water, but also filters out harmful pollutants. The world’s largest air freshener, which boasts a signature citrus scent, took weeks to assemble and required an entire team dedicated to the build. It is currently on display at Soapy Joe’s headquarters in Santee, CA. For more information, please visit https://soapyjoescarwash.com.